Especially since real sushi feels off-limits right now. Let's see. Parasites? Or fruit? Fruit? Or parasites? We'll, um, go with fruit. After reading countless news reports this month about the rise of Anisakiasis, the sickness one risks getting if he or she eats parasite-ridden fish or seafood, let's just say we've been taking a little time off from our favorite sushi restaurants. The parasite is most prevalent in raw or undercooked fish, which makes the idea of consuming sushi or sashimi a little worrying right now. Of course, if sushi chefs are properly trained to spot the parasite, and if the fish itself is frozen and treated under the right conditions, there's nothing to worry about. Once we get over the initial shock, wee'll be hitting up our favorite sushi spot again sometime soon. In the meantime, however, as we cope with our distress, we're looking for other ways to get our sushi fix without, you know, parasitic worms making a home in our intestines. Our solution? Frushi. 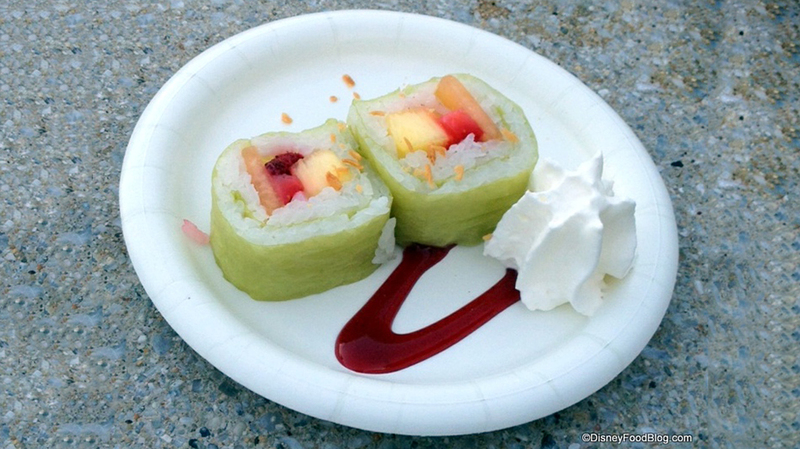 Yep, it's exactly what you think it is: fruit sushi! And in the absence of the real stuff, we've been staring nonstop at photos of these fun, fruity rolls. #Frushi your way to the weekend! Disney's Epcot has sold an ultra-pink frushi for a while now that's definitely pleasing on the eyes—and also serves as prime Instagram fodder. The recipe, as detailed on DisneyFoodBlog.com, includes regular sushi rice mixed with cream of coconut, then rolled in soy wrappers with hulled strawberries, four-inch-long cantaloupe slices, rectangle-cut pineapple slices, and a garnish of toasted cocnut. Judging from more recent Instagram photos of the frushi, the soy wrapper is now dyed an alluring shade of pink. Meanwhile, Orange Restaurant in Chicago has their own version of frushi. "We handcraft our Frushi using fresh fruit and sushi rice," the description on their menu reads. "Flavors like a maki piece such as orange and ginger rice with pear stuffed inside and the nigiri piece as a coconut and lime rice with strawberry place [sic] on top." If you live near either of these magical frushi vendors, do report back once you've tried the dish. As for the rest of us, we'll have to DIY our own frushi at home. Either way, it's bound to be a nice diversion from the current, unfortunate state of sushi affairs.